Exfoliation is done after the skin is cleansed and toned. The process helps remove dead skin cells and clear the pores of dirt so as to maintain healthy skin. In fact, it makes your skin appear young, smooth, and radiant. Moreover, regular skin exfoliation is useful in reducing clogged pores, hyperpigmentation, wrinkles and fine lines. Another advantage of exfoliation is that it encourages easier penetration of skin preparations such as face masks and moisturizers. You need not exfoliate the skin every day, though. You can use an exfoliating face mask about once or twice a week. You can prepare a natural face or body scrub at your home itself by combining binding, abrasive, and moisturizing ingredients. Most homemade exfoliating recipes particularly make use of granulated sugar because it is a humectant that hydrates your skin by adsorbing moisture from the air. People usually prefer to use brown sugar for this purpose as it is relatively gentler on skin. 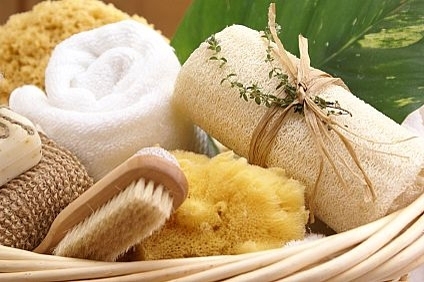 Besides, you can make use of an exfoliating scrub, brush, microfiber cloth, or pumice stone and follow with a moisturizer. • Mix equal quantities of instant oatmeal, cornmeal, and wheat germ oil. Next, add enough water to form a paste and apply on your face and neck. Rinse it off after 10 minutes. You can use this as a body scrub as well. • Add one cup of jojoba oil, one cup of liquid castile soap, and eight drops of grapefruit essential oil in a cup of sugar. You may add a few drops of other essential oils like rosemary and lavender as well. Gently scrub your skin (use upward and outward circular motions) with this mixture and then wash it off after 10-15 minutes. • Those who have a sensitive skin can rub a mixture of brown sugar, honey, and ground oatmeal. • You can exfoliate the skin on arms and legs simply by rubbing a combination of equal parts of sea salt and extra-virgin olive oil. Do not use this solution on sensitive areas like face and neck. • Another simple way to exfoliate your hands is to lather a moisturizing soap on your hands, dip your fingers in a bowl of cornmeal, and massage the tops and insides of your hand (avoid rubbing the cuticles). Finally, wash your hands and apply aloe vera or vitamin E gel. You may apply a moisturizing cream, too. • You can make a body toning and exfoliating scrub by adding two tablespoons of sugar, one tablespoon of finely ground coffee grinds, and one tablespoon of lemon juice. You may also add honey in this recipe. As coffee grounds are useful in getting rid of cellulite, you can prepare an anti-cellulite coffee scrub as shown below. • In case you have oily skin, consider using a homemade exfoliating recipe by applying a mixture of one tablespoon each of sea salt, honey and a few drops of patchouli oil on wet skin. You may add a paste of blanched almonds as well to promote skin whitening. Patchouli essential oil is good for acne, eczema, and inflamed skin. • Soak 8-10 almonds in water overnight. In the morning, peel their skin and grind them to form a paste. Next, add a teaspoon of rose water in it apply on your face and neck. Wash it off after 10-25 minutes. • Apply an exfoliating facial scrub prepared by mixing a quarter cup each of fuller’s earth and dried orange peels, two tablespoons of ground oatmeal and sufficient water to form a paste. It is highly beneficial for oily and acne-prone skin. • Mix two teaspoons each of olive oil, sweet almond oil and a few drops of lavender, sandalwood, or any other essential oil in half a cup of sugar. Scrub your hands and feet with this paste about two times in a week. • Prepare an exfoliating face and body scrub by combining one tablespoon of ground oatmeal, two teaspoons of yogurt, and a teaspoon of lemon juice. Apply on skin for a few minutes and then rinse it off. Furthermore, you can simply add a teaspoon of baking soda in a facial cleanser and scrub your face with it. Another easy solution is to apply baking soda mixed with a little water, just enough to make a paste. Massage your skin with this paste and wash it off with warm water after a minute to exfoliate the skin and heal acne, too. You may create your own exfoliating scrub recipes by adding different fruits (like banana, papaya, strawberry, peach, apple sauce, etc. ), ground nuts, cinnamon, turmeric, milk, cream, yogurt, glycerin, green tea, and various other ingredients.